Condition: Pristine, with vivid colours. Notes: Yoshida Hiroshi's most sought-after scene. The drum bridge at Kameido with ancient Wisteria in full bloom. 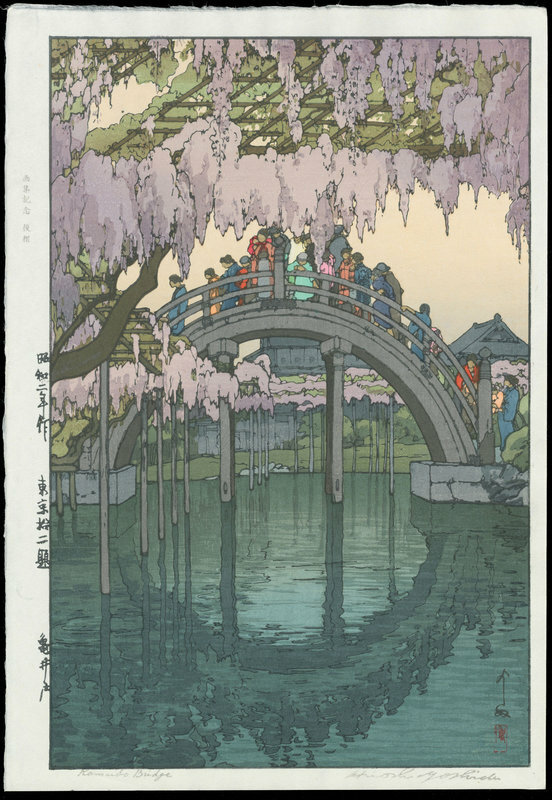 Widely considered to be among Hiroshi Yoshida's masterpieces. Date and title in the left margin. Signed Yoshida, with artist's seal Hiroshi, in the image area. Vivid, pristine colours. Ten blocks and 88 separate impressions were used to create this beautiful design. "Gashu Kinen Atozuri" stamped in the left margin. This edition was to commemorate the first major book publication of Hiroshi Yoshida's works.